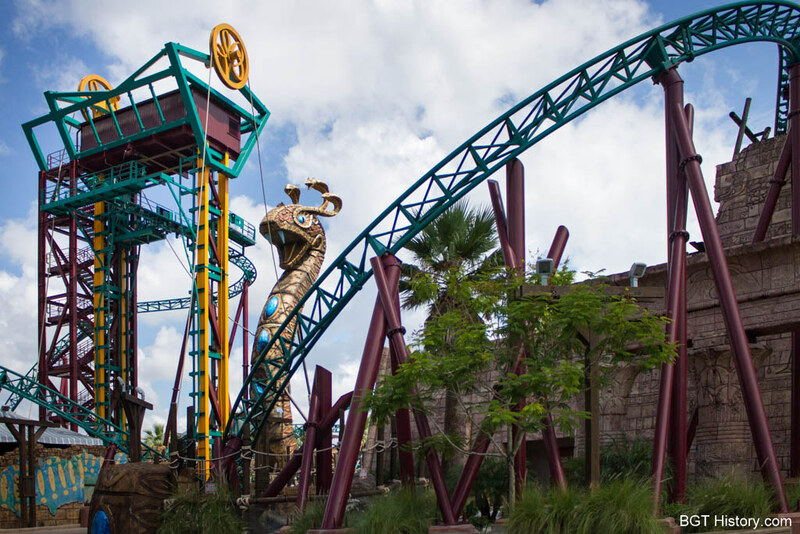 Cobra’s Curse is the newest roller coaster at Busch Gardens, opening in June 2016. The family style steel coaster features three different on-ride experiences – a section facing forward, one facing backward, and then a free spin section. Cobra’s Curse has the most detailed queue and storyline of any of the park’s attractions. The queue is also the only in the park which is predominately indoors and air-conditioned. The story begins outside the attraction, with the large stone body of the Snake King wrapping away from the lift tower and around the front of the gift shop and queue building, to where it has been “raised” above the entrance. Guests entering the main queue go through a short switchback outside, under scaffolding from the dig site, and into a hallway where workers tools and messages can be seen about their finds. From there it’s back outside, where the majority of the switchbacks are located, beneath the workers’ camp perched above. Back indoors, guests pass through the excavated tomb, with hieroglyphs along the walls telling the story of the Snake King. The first room holds a variety of “antiquities” uncovered by the archaeologists, and the live snake exhibit. From there, guests pass through another darkened hallway before entering another large chamber. Inside that room, one wall seemingly comes to life through the use of projection mapping. One last hallway awaits guests before the station, where a safety video plays overhead with rider information. In the station, guests are grouped together before being directed onto the moving walkway and into the cars. Cobra’s Curse participates in Quick Queue, with the entrance located just to the left of the main entrance for the ride. The Quick Queue line bypasses a majority of the interior scenes, including the snake habitat and projection mapping room. Riders must be at least 48 inches tall to ride alone, or at least 42 inches with a parent or guardian. Busch Gardens Tampa puts a spin on family thrills in 2016 with a brand new family thrill ride – Cobra’s Curse. This spin coaster is the only one of its kind in the world, featuring a vertical lift and taking riders on a whirlwind adventure of exciting explorations. Located in the Egypt area of the park, explorers will come face-to-face with an 80-foot snake icon, trek over the park’s Serengeti Plain and discover the mysteries of an Egyptian archeological [sic] excavation. “This isn’t your ordinary spin coaster. In true Busch Gardens style, we’re putting a twist on this attraction and taking riders on an unforgettable and exciting journey,” said Busch Gardens Park President Jim Dean. The first official construction update provided by the park was released on their blog on July 14, 2015. The post described recent progress, which mostly entailed demolition inside of the former Tut’s Tomb attraction and around the site where Cobra’s Curse would be constructed in the coming months on the 2.5 site. In the second official construction update on August 14, 2015, it was shared that demolition had been completed and work had moved to installing underground utilities and pouring the concrete foundation for the 95 foot tall vertical lift tower. The square foundation is 20 feet deep and 40 feet wide, taking 25 trucks to bring in the 6,750 cubic yards of concrete poured into the forms strengthened with steel rebar. It was also note the first batch of ride steel work had been started in Germany, and would make the 4,800 mile journey to the park in the fall. A third official construction update was posted to the park’s blog on October 9, 2015. It detailed recent work on the site, including the installation of the first steel ride supports the previous week, and the first track segment on the 9th. A total of 14 shipping containers of ride steel had been delivered for the project. Other work completed prior to the update included foundation work for the station and lift tower, two trenches dug out, and a number of support foundations poured and awaiting steel columns in the weeks ahead. The fourth official construction update on the park’s blog was posted on November 20, 2015. By that point, a total of 34 shipping containers of ride parts had arrived at the park, and about a third of the track had been assembled, including the break run where the cars turn backwards and the traditional lift hill. The first and second trenches were complete, and walls were up for the station and maintenance building. Ringing in the new year, the park posted their fifth official construction update on January 12, 2016. Work over the holidays included roof trusses being installed over the station and maintenance building, and much more of the track including the highly banked turn over the new guest pathway being built. The focus of the work in the following weeks was on the vertical lift tower and stairs attached to it for maintenance and emergency access. The release stated the 400-cubic-foot snake exhibit would include Jameson’s mambas, Angolan pythons and rhinoceros and gaboon vipers. Along with thematic elements relating to the ride, the exhibit was also being designed with various enrichment components. By late February 2016, the two highest points of the new attraction were topped off – the 70 foot vertical lift hill, and the 80 foot tall Snake King icon. The giant snake icon weighs 30,000 pounds, and is made up of nine stackable pieces hoisted into place by a crane. It features four foot long fangs, and three foot wide eyes. The final track piece, weighing 4,475 pounds, was put into place on Saturday, March 19, 2016. On June 10, the park announced Cobra’s Curse would officially open to guests on Friday, June 17, 2016. Additional details and images on Cobra’s Curse will be added in the future.